Elements of a Voluptuous Beauty: Blue blazer & Blue stripes!! Hope everyone is having a wonderful THURSDAY!!! I'm back in California...awh sun I did miss you :-) lol. I had a wonderful trip and I'm glad that I'm back home. I've basically been asleep all day...drained from the journey so nothing really has been done. Pictures of my trip will be posted in the future posts! However, I was able to go out with my friend for dinner. We both have the same birthdays and recieved a $30 gift certificate to Benihana's (A Japanese teppan grill--great restaurant). Ladies, I suggest signing up for newsletters and club for your favorite place many do give out free gifts during your birthday month! That's how we received our gift certificate. I ordered the Hibachi lemon chicken. Sorry no pictures to show, since they prepare and cook the food in sections I ate it in sections (was really hungry) lol. Overall, Great food, Great company, Great Night!!! At the end of our meal we ate ice cream while others sang the traditional Happy Birthday!! It's good to be back! My friend was meeting me from school so I decided not to be tooo dressy for our dinner date. 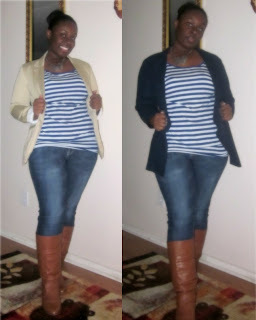 I chose to where a blue and white striped shirt from Kohl's (bought a long time ago). Horizontal stripes get a bad rap for their anti-slimming properties, so I added a nipped-in jacket with perfectly fitted jeans from G-stage.Necklace and Boots from Charlotte Russe (also seen in Baby Blues). I also added a contrasting colored blazer at home. My fav is the tan colored blazer. Which do you ladies like best? Hope you enjoy the pics. Until next time Beauties! !